This is actually the end my friends. I hope you've enjoyed our story. Don't worry, Zoltar, in four years time we'll become humming birds and will be allowed to go down to the Earth. 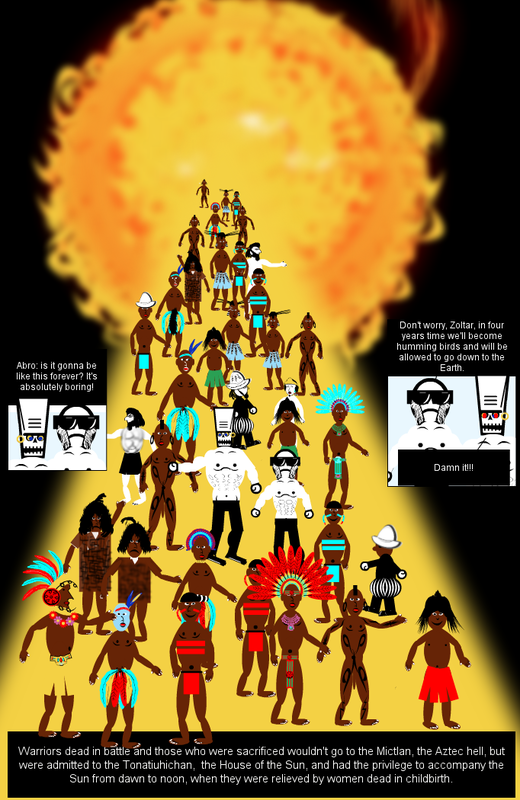 Warriors dead in battle and those who were sacrificed wouldn't go to the Mictlan, the Aztec hell, but were admitted to the Tonatiuhichan, the House of the Sun, and had the privilege to accompany the Sun from dawn to noon, when they were relieved by women dead in childbirth. Abro: is it gonna be like this forever? It's absolutely boring! me gustan porque son lindos y vuelan rapidísimo! pues volver de colibri esta bien!! Lol all we need now is a guide to pronouncing the Aztec words :P Great job! There are some Conquistadores too...were they good too? qsputnik,lo dices por lo del fin del mundo? ¿Preparando el 21 de Diciembre? And enjoyed we did! I think this is a great end to a great story. (: Fantastic that it's bribe, congrats!